Armed with the Grandvewe Yoghurt and needing to use up the last of my lemons I turned to the ever reliable Australian Women's Weekly to find something to make. The answer came in the pages of their book "Bake". 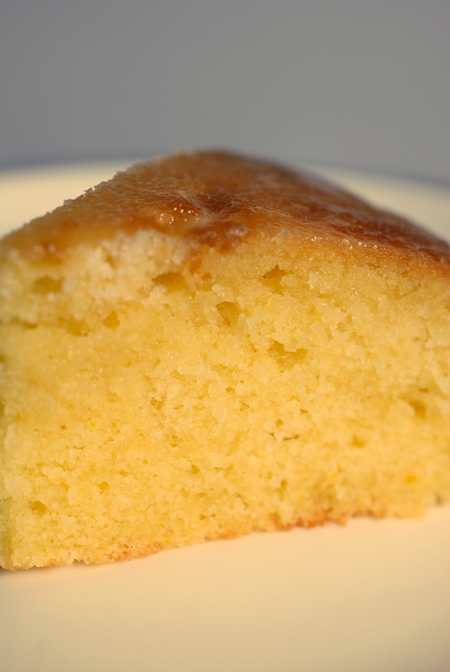 It certainly ticked all the boxes - the cake uses yoghurt and as an extra bonus, semolina and when cooked, its soaked with a sweet but tangy, lemon syrup. Place the sugar and lemon juice into a saucepan and and place over a low heat. Stir until the sugar has dissolved and then allow to come to a gentle simmer. Remove from the heat and set aside. Whisk the egg whites until soft peaks form - set aside. Place the butter, sugar, lemon rind into a bowl of an electric mixer and beat until light and fluffy. Add the egg yolks one at a time, beating well after each addition. Sift the flour with the semolina and add it and the yoghurt to the creamed egg mixture. Stir this through until combined. Take a spoonful of egg white and fold it through the batter to slacken it and then add in the rest of the eggwhite - fold through with a metal spoon. Pour the mixture into a lined cake tin (22cm/9 inch) and bake in a preheated 180°C/350°F until golden and cooked through - this should take around 45 minutes. Let it sit in the tin for 10 minutes before turning it out onto a wire rack. 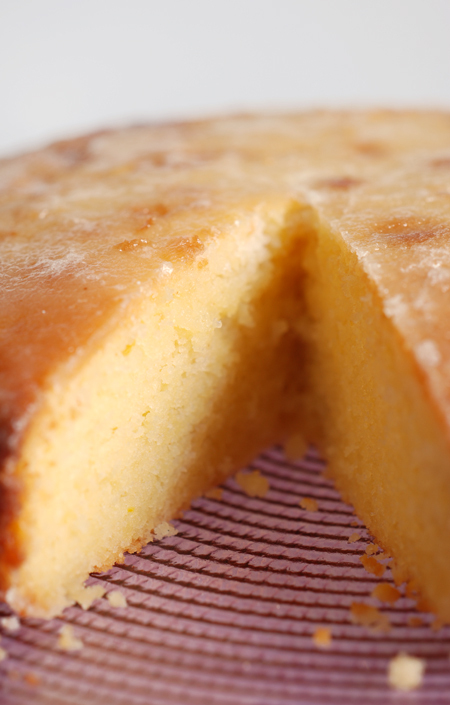 Pour the warmed lemon syrup slowly over the cake - make sure it has soaked in before continuing to pour. Once all the syrup has been absorbed let the cake cool. As the syrup sets it will form a translucent glaze over the cake. The interior is almost lemon-like in colour - probably due to the eggs used, its wonderfully moist with a soft and almost creamy texture due to the semolina and yoghurt. 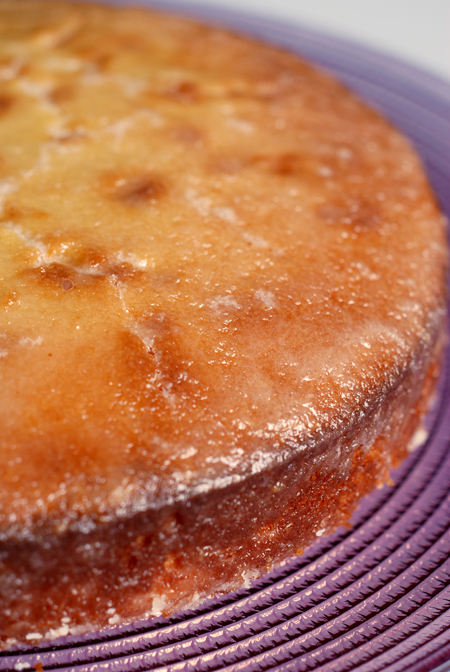 The lemon flavour both scents and gently infuses the cake. You don't need to serve this anything on the side, perhaps a cup of tea or coffee - it's an ideal tea-time treat. That looks absolutely delicious! I don't have self-raising flour. What would be an appropriate substitute? Thanks. I made this today. Some of the butter melted and leaked out of the pan and burnt in the hot oven, leaving a somewhat unpleasant taste to the cake. Just detectable but stil. Any idea what I did wrong? Do you think the amount of butter could be somewhat reduced? Hi Honeybee - I'm a bit confused, not sure how the butter can melt when it is creamed and part of the cake mix. How exactly did itleak? What type of pan did you use? Hihi, I am actually just a bit confused, too! :)) I used a long rectangular pan which consists of two parts so the length of the pan can be adjusted which is why it is possible for anything to leak. I lined the pan with parchment paper but still. Maybe I didn't cream butter, sugar and eggs well enough? It just seemed to me that the end result was very greasy - it doesn't look like that on your pictures. I'll try again soon with a little less butter and report back to you! The thing is, this cake ticks all the right boxes for me, too!! Reporting back to tell you that I made the cake again, this time using only 150g of butter. I loved it!! I'm still puzzled as to what went wrong the first time around? Different flour, semolina, yoghurt? Did you use the greek variety, btw? Anyway, this one is a keeper! !